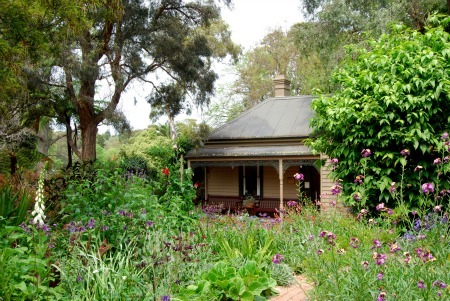 The Plant Craft Cottage is a gorgeous little heritage listed cottage tucked away in the Royal Botanic Gardens where members of the cottage group make........ wait for it...........crafts from plants! Surprised you there huh?! 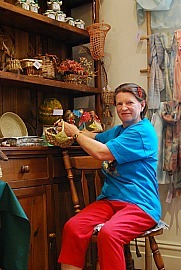 They do basketry, dyes, fabrics, papermaking, plant cards from dried flowers, pot pourri and there’s also a group who look after the delightful cottage gardens. These gardens are a photographers dream with the vibrantly coloured flowers fronting the quaint olde worlde cottage – at least it was when I visited last autumn anyway. ...........It’s near the north-west side of the Royal Botanic Gardens close to Gate H.
.............Just be aware though that they sell some lovely stuff and I even bought a present there for my daughter so I imagine most of you'll also find it hard to resist as I rarely buy anything anywhere! If you turn up on one of the Demonstration Days you'll be able to watch free craft demonstrations. ..............That’s a real shame as the cottage has an interesting history and is actually among the oldest properties in Melbourne. .............He then became Director of the Gardens so moved into the Director’s residence which was a much more prestigious building. The cottage came under threat of demolition in the 1970’s but was saved and became known as the Plant Craft Cottage in 1981. Look up Craft Cottage website to find when the free Demonstration Days are. They do workshops too but charge for these. 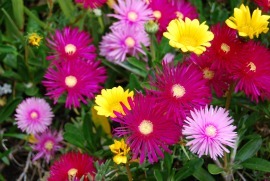 All charges do go towards maintaining the property though so it’s all in a good cause. If you'd like to splurge and become a Member of the cottage so you can join in the craft groups it's only $35 annually (or $40 for a family membership) which hopefully won't break the bank either.